Did you know: Ulysses S. Grant Drove a Studebaker? In 1852, the H & C Studebaker blacksmith shop was established in South Bend Indiana by brothers Henry and Clem Studebaker. They first started with farm wagons. Earning a reputation for quality and durability, they expanded into the manufacture of carriages in 1857. The Studebakers begin supplying wagons for the Union Army during the civil war. By 1867 Studebaker had provided 6,000 vehicles to the Army, as well as carriages for President Abraham Lincoln and future presidents Ulysses S. Grant, Rutherford B. Hayes and Benjamin Harrison. The carriage for Ulysses S. Grant was used during his term as president from 1873 to 1877. After leaving office, Grant continued to use the vehicle at his private residence until his death in 1885. The carriage is a basic model of the landau style and was pulled by as many as six horses. 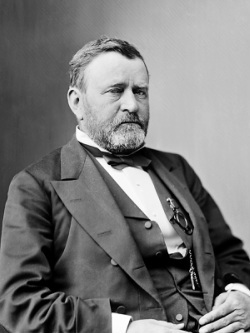 Grant transported many distinguished guests in the carriage including Presidents Rutherford B. Hayes and Chester A. Arthur, King Kalakua of the Hawaiian Islands and Viceroy Li Hung Chang from the Chinese Empire. Civil War Generals William T. Sherman and Phil Sheridan also rode in the carriage with their former commander. On October 2, 1910, the Studebaker Corporation purchased the carriage for the company’s historic collection. It was purchased by Colonel George Studebaker, son of Clement Studebaker, from General Frederick Dent Grant, son of the president. The carriage is currently on display in the Studebaker Museum in South Bend Indiana next to the carriage that Abraham Lincoln took to Fords’ Theatre on the night that he was shot. Studebaker branched out to carriages and made electric automobiles in 1902 and 1902 and its first gas-powered vehicle two years later. They quit making horse drawn vehicles in 1920. The company became the American importer for Mercedes-Benz, Auto Union, and DKW automobiles. Even with this diversity Studebaker fell victim to corporate profit taking and quit making automobiles in the United States in 1963 and closed operations in Canada in 1966.